Set for a 3 day auction. Finally selling off my Z7U - Get a great price for this camera. The lens has a servo issue with the sticky lens deal, but the body is in excellent shape - photos of hour meter in auction. I need to get out of this camera, so it is priced low to sell fast. Need a new Z7U body - This is it! Includes CF recorder, remote, manual, original box. The NT5 package has been sold. Got bottom dollar. But thats better than nuttin! They got an excellent deal. A great great sony camera, . So congratulations! 299 - buy it up now!!! New they are 524 on bh. Above relisted for sale. Don't hesitate to mail me if any questions. Selling to fund Leica M glass. Pay pal and bank wire accepted. Thanks for looking. I'm selling my Sony VCL-308BWH wide angle lens for my Z7 - it will of course fit other cameras with the right mount. It's in excellent condition with hardly any marks from use, optics all perfect, always very well cared for. It comes with a B&W hard case. The lens is in London, UK but willing to ship internationally at cost. Selling on behalf of my friend Paul Noble. £1450 or make an offer. 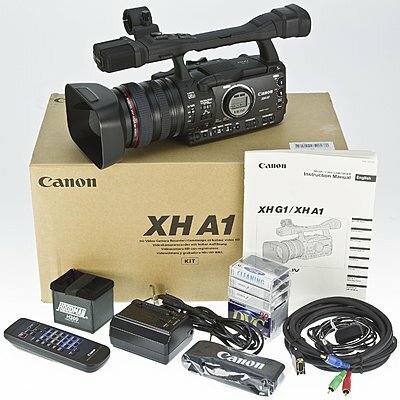 Canon XH-A1 w/ official HC-4200 steel case + extra battery! The camera has less than 40 hours of use and has no cosmetic dings/scratches. I am the original owner and it was bought through BHPhoto video brand new. It has never been used professionally and has been maintained and cleaned routinely. I used only HD quality sony tapes through the head. Comes with the official Canon HC-4200 case which has some scratches/dings but there is NO damage whatsoever on the camera and it is in perfect working order. I'm selling the camera because I haven't been using it as of late now that I'm in class full time. The item comes complete with all of the items in the original packaging (video cables, manual, charger, battery, etc) minus the original box. I am Paypal verified and will ship the following day after payment is received.